This is one of those posts where you sit down to type it. Erase it. Retype. Repeating it over a couple times because you are struggling to find a way to share all the thoughts tumbling around in your mind. It's evident to those around us that this past year has been eventful and very blessed. Bringing home Josiah has changed our lives in amazing ways and the move to Fort Wayne has added to the adventure of it all. Despite the somewhat chaotic life tumbling around us, Jon and I felt God nudging us to grow our family. We started praying about adopting again, this time through domestic adoption. We also started talking about looking into foster care as a potential ministry for our family as well. So late February we met with Gateway Woods to get council and get started on our Home study paperwork. Just as we had with Josiah, we started bathing our "next baby's" birth family in prayer. Curious thoughts filled our mind as we wondered who they were, how they were doing, and praying our Father would give them peace and comfort. When you adopt a child, the lack of control brings your knees constantly as you understand that only God can answer your desires to protect and care for this child and to bring healing and preparation for the birth family, baby, and our family. The paperwork began and I began agency researching; stressing and praying for guidance from others and God. So when I got hit by the "flu" that lingered, it took a few off hand comments of others to bring me out of complete denial that I was in fact pregnant. Hands shaking I took the two pregnancy tests that I intended to give a friend for her bachlerette shower and literally stood their shaking and numb. WHAT? Truthfully, Jon and I had no known fertiliy issues, and made the decision to adopt internationally because that's how we felt God was leading us. But I wouldn't be being honest that based of some past experiences, we assumed if I was going to get pregnant, it was going to be because we were "trying." I typed to a dear confidant that day...Needless so say I am blindsided by this change of events. Excited, but blindsided. I cried on and off all afternoon as I mourned the loss of this baby I had been dreaming and praying about. I felt guilty as I prayed to God in thankfulness and confusion. How can I be so excited and so disappointed? I am also ashamed to say it has taken weeks for me to get to the place that I have accepted the fact that God is in control of our family and He knows best! 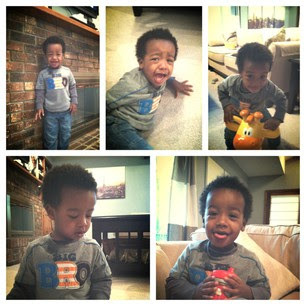 I had fully convinced myself that what was best for our family, specifically Josiah, was to adopt again. Then, we would try for biological children. So here we are, heading into week 12. As much as we enjoyed the the joys of the first trimester (that is obviously sarcastic), we are so thankful to be moving forward and seeing what God has in store for our family. For those of you who have been keeping this secret and praying for us, a BIG thank-you! So excited for you! Thanks for sharing your feelings. I have no idea what its like to be praying for a child and then not see them in person. Thats got to be hard. Congratulations! You are going to be such a cute pregnant lady! A baby is always a blessing...even if they catch you by surprise. Congratulations! We are excited for your growing family. Even if your plans and God's don't initially match up, it is such a peaceful blessing being in His will. I know I don't really know you well, but enjoyed reading this. God definitely has His own idea on how/when he brings kids into a family. I seriously relate to so much of this post...being shocked about being pregnant because I thought we'd have to really 'try'. And feeling guilty about not being happy about it and relief of getting out of that first trimester. :) I have to say though, meeting the child that grows inside of you is pretty wonderful. Hope it's an easy pregnancy! Not sure how I missed this post.....Wow! So excited for you, but yeah....I can imagine the feeling of being blind-sided. Blessings to all of you on this newest journey!